As people flock to cities, low-carbon transport must become a priority if we are serious about tackling climate change. The transport sector currently contributes to 23 percent of all greenhouse gas (GHG) emissions—and its share is rising. Further, transport is also almost exclusively reliant on fossil fuels (96 percent) and is responsible for almost 60 percent of all oil use globally. Without action, the future looks frighteningly car-dominated. Some projections anticipate for there to be a total of 2 billion vehicles on the planet. This kind of business as usual is entirely unsustainable, especially if we want to avoid the catastrophic economic and human impacts of a world that does not dramatically limit its temperature increase. Transport is one of the few sectors where GHG emissions are still growing; and while this presents a major problem for emissions, it also means that innovations in this area will create dramatic changes. Beyond environmental benefits, sustainable transport also plays a major role in establishing equity. Historically, those without access to personal vehicles have been subject to inequitable government transport spending, which has largely centered on infrastructure for cars. When governments invest in sustainable mobility that is accessible, it results in reduced transit time, improved mobility and economic access, enhanced road safety, and bettered human health. Recognizing the large number of pedestrians (everyone), cyclists, and public transport users—while investing in their safety and access to services—can ensure that the livelihoods of urban populations are improved overall. Financing low-carbon transport, and accompanying it with an urban form that is connected, is a highly efficient investment. Instead of building more roads and subsidizing fuel and private motorized vehicles, sustainable transport is proven to be a healthier, more sustainable, and more economically viable approach to urban design and transport planning. Preventing the harmful urban sprawl that is propagated by car-centric urban planning, for example, can prevent the locking-in of long-term congestion, as well as the overall resource inefficiency of sprawled patterns of growth. Every city has a choice to make, and some are already shifting towards the construction and expansion of sustainable transport networks. This change, toward low carbon and shared transport, is especially critical in regions with high rates of urbanization, as well as developing countries. Consider Rio de Janeiro, Brazil, which has a high-quality bus rapid transit (BRT) system that serves 9 million people, saving 7.7 million hours of travel every month. Each bus on the two corridors—TransOeste (56 km) and TransCarioca (39 km)—replaces an average of 126 cars, resulting in a 38 percent reduction in carbon dioxide emissions along the corridors. 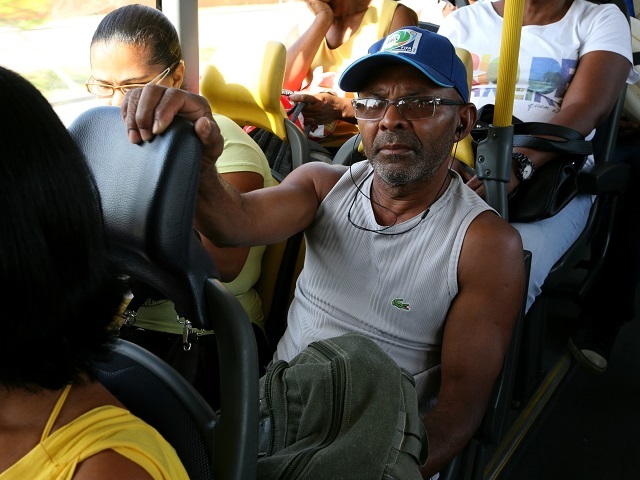 Long-term, the city aspires to make its BRT system the best in Brazil by 2018, and will launch the new TransOlimpica corridor in 2016 to support key locations for the Olympics and provide connectivity to existing corridors. This program has reduced congestion, improved air quality, and, as a result, improved the health and livelihoods of locals. The ultimate goal is to avoid motorized trips altogether through better planning, and move away from car-based transport towards more connective, sustainable options. While it’s important to do this in ways that respect local context, some general options include: increasing safe walking and biking, improving multi-modal inter-connectivity, and offering quality safe public transport, such bus rapid transit. For the trips that have to be made in cars, we can make sure that vehicles meet the most stringent fuel economy and safety standards. Electric vehicles are a good example to follow, and have proven to reduce lifecycle emissions. Car-sharing schemes are another transitional option, encouraging a reduction in car ownership, reducing overall demand for parking, and offering benefits to air quality and emissions goals. Provisions that encourage the growth of electric vehicles and car-sharing are a start to combating personal vehicles, but should be accompanied with an increase in collective, public transport. Brazil, for example, has met success with car-sharing; one program has more than 3,300 members sharing 56 cars, as of January 2014. In the coming years, the world will need to expand transport networks in major ways to meet the rising demand for sustainable mobility. There exists a wide range of options for cities to make transformative change through transport, and the multi-sectoral benefits of such changes can no longer be ignored. In the next few weeks, COP 21 will provide a forum where recognition of the importance of transport should inspire greater investments in sustainable mobility. The transport community, coming together in support of accelerating action on climate change (#WeAreTransport), is ready. We Are Transport! We Have Solutions!